Building (or reopening) a train station or section of track costs a fortune and takes an age. How can we make things quicker and easier so the worthwhile projects actually get built? Our new guide aims to do precisely this, helping good projects get on track. Working with Railfuture and with support from the Department for Transport, Expanding the Railways takes local authorities, developers and communities through the process from having an initial idea for a rail project right through to running the first train. 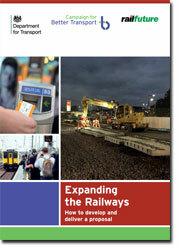 To read Expanding the Railways, please fill in your details below. The report is free and we won't sign you up to our e-newsletter unless you tick the box to say we can. We will never sell or share your contact details.